I went to a wedding this past April, and if you’re my friend on Facebook or follow me on Instagram, you already know that. Andrea, one of my best friends and college roommate, married her husband a month ago. Instead of waiting weeks for the photographer’s photos to appear online, I watched as guests populated social media feeds in real-time, sent Snapchat videos to our friends who could not make it, and recorded our own clips of the reception. It’s how Millennials are doing weddings. The first of my friends to tie the knot, Andrea integrated social media into her big day along with events preceding the wedding. Shortly after Andrea called me to announce her engagement, the news “officially” appeared on Facebook along with a picture. Flooded with comments of well-wishes and “likes,” the buzz on social media continued leading up to April. I watched excitedly as teasers of hairstyles, table numbers and reception decorations peppered her Pinterest board. The bridal party and I even took an idea from one of her pins for a bachelorette party gift. Upon arriving at the hotel, guests were instructed to use the hashtag #clariziowedding to share any and all photos on Instagram. 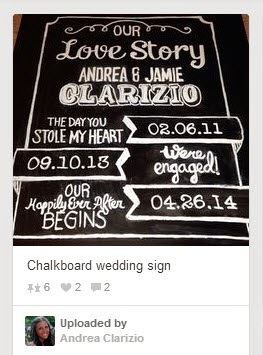 At the reception, Andrea's DIY details, some foreshadowed by her Pinterest boards, personalized the venue. Even the maid of honor speech had a digital touch with notes drafted on an iPhone. 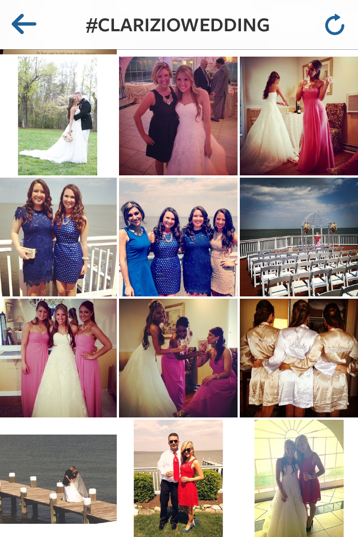 Andrea is not alone in using social media to plan her wedding. Nowadays, a wedding day narrative is told not just through photographers and videographers, but instantly through the phone camera lenses of family and friends. The bride and groom can see the wedding develop through the eyes of their guests. In fact, according to an article on Business Wire the average wedding guest shared 22 wedding-related photos on social media, and 4 in 10 recent wedding guests reported that use of a specific hashtag was encouraged. For better or for worse, we continue to move into an age of increased digital sharing. Millennials are especially guilty of constant participation in social media platforms. While I feel that hiring a social media wedding concierge is extreme (no, my friend did not have one), I loved being able to take part in and contribute to my friend's wedding story. Admittedly, I was sad not to see any new posts during the last two weeks. It's been fun reliving details of that perfect weekend. Then again, I am still waiting anxiously to have a girls night and watch the wedding video - let's hope they didn't catch too many of my dance moves!